Always the right weather for your photos. Weather phenomena such as lightnings or nebulae are not placed as a graphic over the image in NATURE projects and charged, but mathematically generated exactly. This results in deceptively real representations, but just no exact repetitions. And NATURE projects can do even more: The program not only produces the flash, but the matching mood of light with dark sky and rain! The strength of these weather phenomena can be easily adjusted with sliders and adjusted to your taste. With the “weather randomizer” you can create a random weather condition of the existing weather moods. At the push of a button, the weather changes. You simply click until you like a certain effect and then only adjust the effect size. The following sample pictures show the fantastic effects and it’s really that easy! 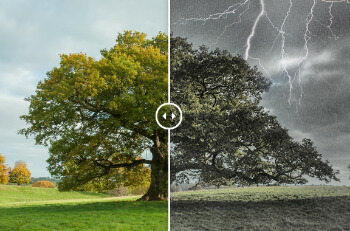 Daylight seasons and different light sources have a big effect on the image result. Not only motive, picture distribution and sharpness contribute to a successful picture, but also the light situation. With NATURE projects, you can change the light moods in the picture with a mouse click and conjure up wonderful mood pictures that perfectly set your motif in scene. Which of the two mood pictures with the bride at the window do you like better? How often do you experience that your photo does not reflect the beautiful day as you experienced it? In this case, the sunless effect was applied to the colorless image. Now it does justice to the memory.